Ok, I put my hands up to near daily blow drying and a swipe with hot irons, and then I wonder why my hair breaks at the ends! I love this conditioner – its new to me because I tend to stick with my old favourites (Fekkai, Ojon and Oribe), but think it is quite a find. It contains Phellodendron (otherwise known as Cork Tree and native to Asia), sandalwood and barley to smooth hair cuticles (ideal for naturally curly hair like mine) along with quinoa protein to add strength. Ideally, you’d use it with the other two products in the line, Damage Remedy Restructuring Shampoo and Damage Remedy Intensive Restructuring Intensive Treatment. User wise, it’s scent is herbally, based on Aveda’s Purefume – normally I don’t like it but on my hair, it smells fresh and clean. Most importantly, especially for those of us with thick hair, it rinses out really easily. The number of times I’ve used a treatment conditioner and the effort of rinsing out far outweighs the benefits in the first place (Herbal Essences Hello Hydration Mask you are guilty as charged! ), so its great to find a thick, emoliating conditioner that rinses away quickly and easily and still leaves your hair feeling lovely and soft. 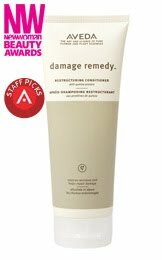 Damage Remedy Restructuring Conditioner is definitely one for summer hair that’s suffering from frizzles, or hair that’s been at the straighteners one too many times! Oh, Man! That Is One Ugly Beard. Ooh nice, I was given a sample tube of this last time I was at the Aveda salon, so I’ll look forward to using it! Would it help coloured hair that is coated in chlorine? I swim a lot and desperately need to find some good hair products!